As earlier reported, a tornado and accompanying floods tore through the grounds of Circuit of the Americas on Friday. This followed the extremely wet conditions spun off from Hurricane Patricia the prior weekend. I arrived here last night, the guest of Trans Am driver Ron Keith. Trans Am and the SVRA will race here this weekend, despite the ruins surrounding the track. Tents, never removed after the F1 Grand Prix, lie twisted and torn in angular heaps. Panels pulled out of the canopy for the temporary premium seating lay askew, providing views of the sky. Barrows full of uneaten catering and other refuse from the race are now brimming with rainwater. The tunnel through which our RV was supposed to pass under the track is packed with mud, so we’re waiting to find another way onto the infield. But there’s a frenzy of activity surrounding all of it. 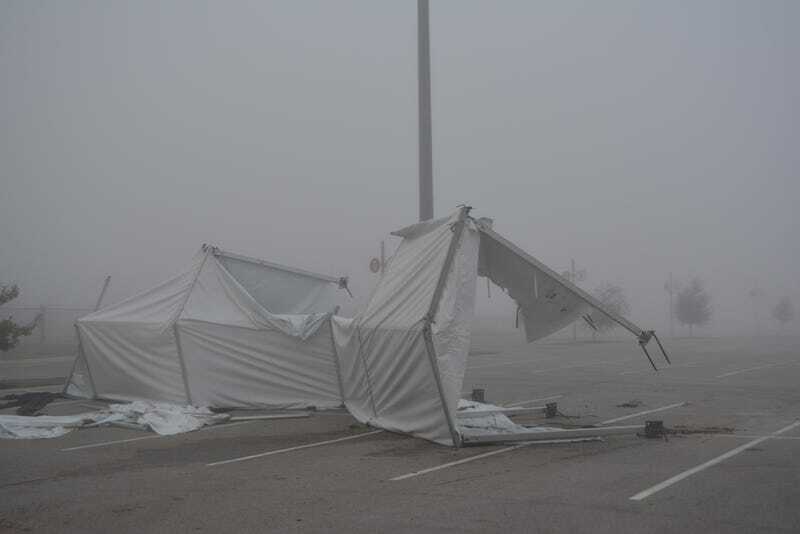 Workers arrived early this morning to resume teardown of the temporary structures and begin to clean up the mess. From what I’ve seen, I’m a little surprised they’re still hosting an event this weekend, but I’m glad of it. They’re going to need the revenue. The track itself seems to be in good shape, so the race is on. More pics as I get them.